To view our upcoming kayak adventures click here >>> or visit the kayak adventure registration page. Located on Follett’s Island west of Galveston Island, Christmas Bay Coastal Preserve is a place for the adventurous as well as the romantic. 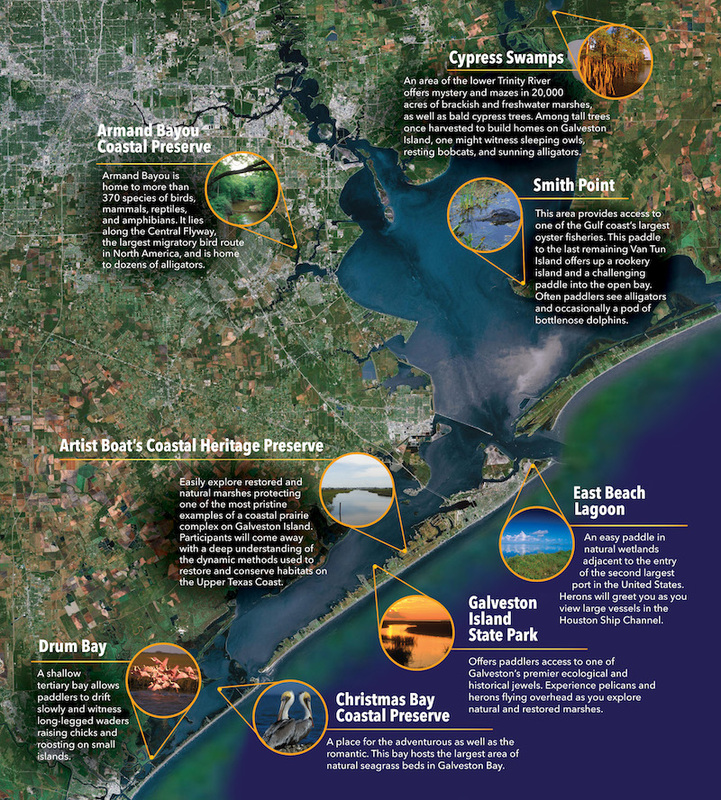 This bay hosts the largest area of natural seagrass beds in Galveston Bay. Four-hour adventures are offered at Christmas Bay. To view scheduled kayak adventures click here >>> or visit the kayak adventure registration page. Easily explore restored and natural marshes protecting one of the most pristine examples of a coastal prairie complex on Galveston Island at the Artist Boat Coastal Heritage Preserve. Participants will come away with a deep understanding of the dynamic methods used to restore and conserve habitats on the Upper Texas Coast. Adventures at this kayak destination begin and end with a short walk (0.3 miles) through the Artist Boat Coastal Heritage Preserve. Two, three, and four-hour tours are offered at the Coastal Heritage Preserve. Cypress Swamp is an area of the lower Trinity River that offers mystery and mazes in 20,000 acres of brackish and freshwater marshes, as well as bald cypress trees. Among tall trees once harvested to build homes on Galveston Island, one might witness sleeping owls, resting bobcats, and sunning alligators. Four-hour adventures are offered at Cypress Swamp on Lake Charlotte. Drum Bay is a shallow tertiary bay the tallows paddlers to drift slowly and witness long-legged waders raising chicks and roosting on small rookery islands. Four-hour adventures are offered at Drum Bay during the spring. East End Lagoon is an easy paddle in natural wetlands adjacent to the entry of the second largest port in the United States. Herons will greet you as you view large vessels in the Houston Ship Channel. Two-hour adventures are offered at the East End Lagoon. To view schedules kayak adventures click here >>> or visit the kayak adventure registration page. Galveston Island State Park offers paddlers access to one of Galveston’s premier ecological and historical jewels. Experience pelicans and herons flying overhead as you explore natural and restored marshes. Four-hour adventures are offered at the Galveston Island State Park. Please note that adventures at Galveston Island State Park require a separate $5 entrance fee for the park.